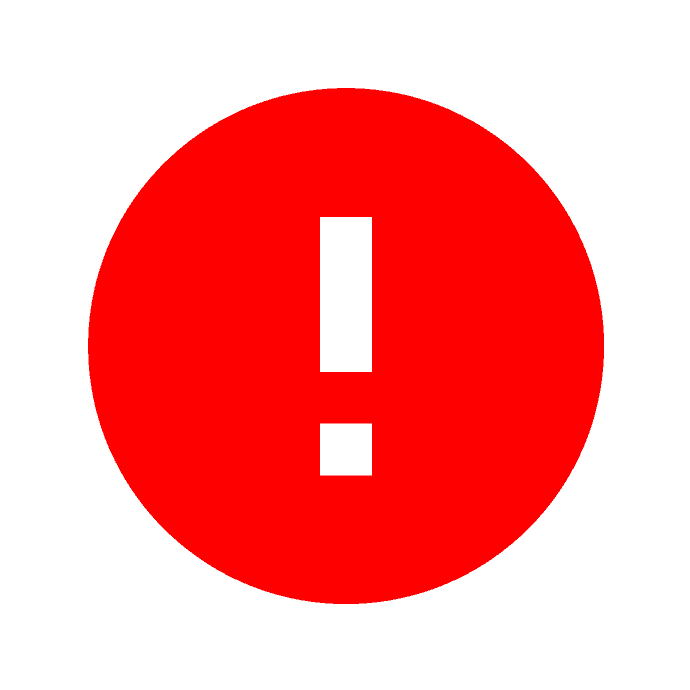 Crockpot Express E6 Error Code: what it means and how to fix it! There’s always a learning curve when using a new kitchen appliance, but getting an error code can certainly take the wind out of your sails! The Crockpot Express E6 error is a common one, but these tips will help you get things working again quickly! What does the manual say? The Multi-Cooker will stop the cooking cycle. Unplug the Multi-Cooker and allow to cool. Once it is cooled down, remove the lid and check the cooking pot. Add liquid as necessary. Ensure a minimum of 8 oz. of liquid is used inside the removable cooking pot. If using a pressure cooking function, ensure that the steam release valve is in the “seal” (closed) position. That’s all well and good, but it’s not exactly clear how long it will take to cool, why it got too hot, how much liquid is “necessary” if you already have the required 8 ounces, etc. I have found the manual to be a good starting place, but you’ll get lots more help from other users or just trying things on your own and experimenting a little. 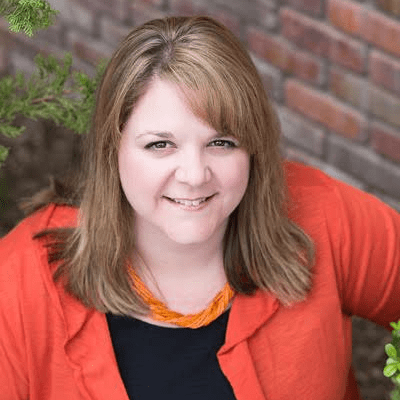 I have joined several Facebook groups for Crockpot Express users, and the information found in them is invaluable! We’d love to have you join our Crockpot Express Community as well! What does the E6 error actually mean? Basically, it means the unit is getting too hot. If you’re trying to cook on a pressure cooking setting but you haven’t closed the steam release valve, it can’t come to pressure and all the liquid will cook away. If you DO have the valve closed but it’s still giving an E6 code, it’s usually one of two things: you don’t have enough liquid or the unit is too warm because you switched from Brown/Saute mode to Pressure Cooking and it’s reading as too hot still. How do I fix a Crockpot Express E6 error? Check to be sure the steam release valve is closed when using the pressure cooking function. If not, switch it closed, unplug the machine and plug it back in to reset and then restart the cooking cycle. Check to be sure you have at least 8 oz. of cooking liquid. Release any steam that’s built up, open the lid, check the liquid levels and add more if necessary. Unplug the machine and plug it back in to reset, then begin the cooking cycle again. Check to be sure the unit isn’t too hot. Sometimes, if you go straight from Brown/Saute to Pressure Cooking, the inner pot is too warm to get a good seal and pressurize properly. To cool down quickly, remove the inner pot and set on a trivet. Leave it out for 5 minutes. If you’re in a rush, try dipping the outside of the cooking pot in some cool water to bring down the temperature quickly. Unplug the machine, plug it back in to reset and try again. I like to use refrigerated liquids if I’m going from Brown/Saute to Pressure to help immediately cool the inner pot. Check to be sure there isn’t food stuck on the bottom of the inner pot. If the food is thick or stuck on, the pot can’t read that there is liquid inside, even if you have more than enough. Give it a good stir and scrape the bottom (don’t use metal!) and then try again. I’ve tried everything and I’m still getting an E6 error! I don’t have any kind of official word on this, but the scuttlebutt around my Facebook groups is that there was one particularly bad batch of Express Pots sold and those owners seem to be getting the E6 errors most often. Look on the back of your machine where the cord plugs in, or on the cord itself. If you have a serial number that begins with “K” you might be one of the unlucky ones. Fortunately, Crockpot has been excellent about replacing faulty Multi-Cookers, so don’t hesitate to call up their Customer Service and ask for a new one! They can be reached at 1-800-323-9519. 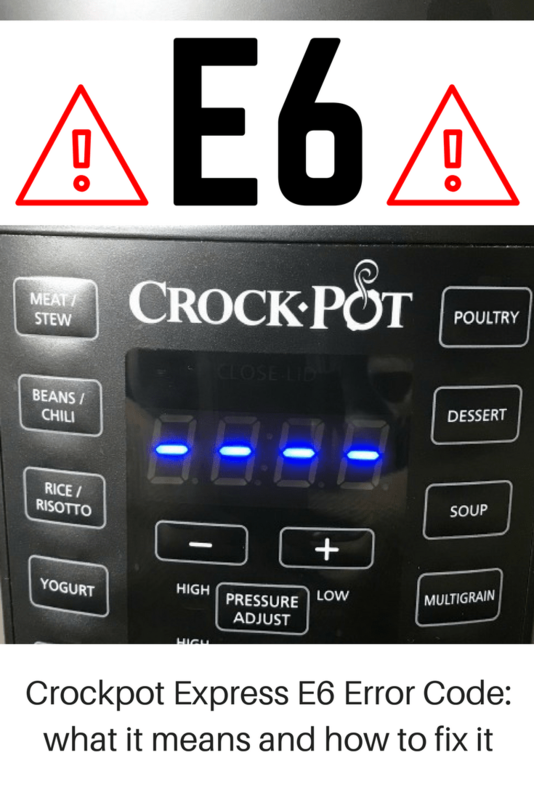 Personally, I have only had the E6 error pop up once, and it was when I was experimenting with my Crockpot Express Apple Oatmeal. When I opened it up, it was obvious I did not have enough water. I added more, closed the lid and restarted the cooking cycle. It worked like a charm! Hopefully you are error free in the future after trying one (or several) of these little tricks. Don’t forget to join our Crockpot Express Community on Facebook for help with other issues and lots of good recipes. Happy cooking! 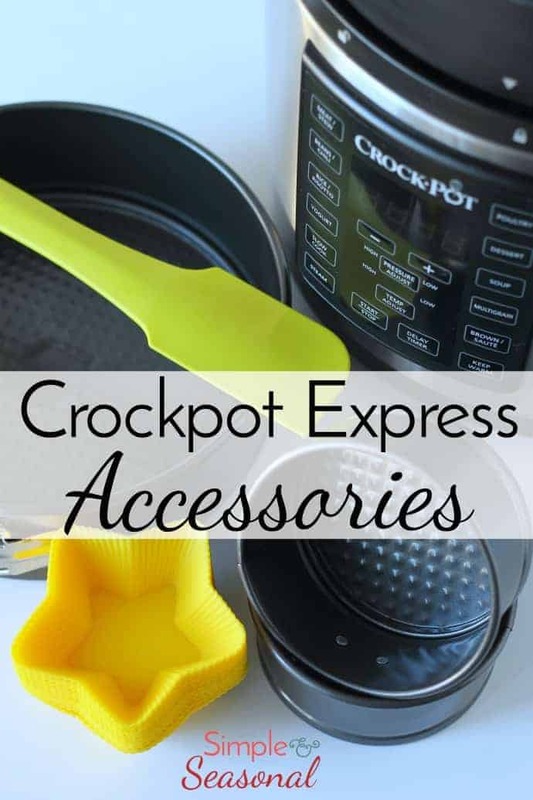 If you’re ready to branch out into “pot in pot” recipes or just want to upgrade to a silicone trivet, check out this list of Crockpot Express Accessories! Thank you, thank you, thank you! I almost returned my crockpot express. All I had to do was add water. This should be included on the trouble shooting on crockpots FAQ’s page. I cannot figure out how to get mine to cook manually. Some recipes call for a specific time and temp (usually high temp). Can you anyone help me? You just need to choose a preset that’s close to the time you want and then adjust up or down. Beans/Chili will go as low as 5 minutes and Steam will go as low as 3 minutes. Those are the two buttons that I use the most. All the pressure cook buttons do the same thing, they just default to different times and pressure settings. thank you for the information. So, if I am getting the e6 message and I believe it has enough water, just give it a stir? Yes, start with that. It may be something stuck on the bottom. If it’s still not working, allow the pot to cool (pull it out and set it aside somewhere) and then unplug the machine. Sometimes it just gets “stuck” after throwing an error code and needs a hard restart. Pull p’ug for a few seconds, plug back in and give the pot a good bit with the palm of your hand and the steam valve will close. Sticky steam valve. I’ve had my Crock-Pot pressure cooker for about one month and I use it every other night. It’s so great. I cooked chicken and rice for 35 people during hurricane Michael last Wednesday before or power went out. I am cooking cubed steak, onions, gravy, mashed potatoes, green beans in my pressure cooker tonight. I finally got the E6 error message, I have nearly 3 cups of liquid in the pot. The flour from my cubed steak was sticking to the bottom of the pot, it was overheating. Gave it a good stir and now it’s working great. Awesome coming tool! Here is another reason for E6 message. I was feeling pretty proud because I ‘d never gotten it. Then today it happened. Unplugged, restarted, happened again so I decided to open lid to see what was going on. When I reached for lid I discovered that it was not fully closed! Chicken wings are now cooking as they should! How long are you waiting? It does take about 10 minutes on average for the pot to come to pressure before it switched off from Heat and starts the time cycle. The other thing that it most likely would be is the steam release valve is open. Make sure it’s flipped closed (to the symbol with the X) so the pot can build up pressure. No, it sits there pretty loosely. It does sit down a little bit it doesn’t click or anything. It’s meant to be loose. Make sure you add water again when trying as well. The first cup will have evaporated and you need a full 8 ounces to get up to pressure. Got that message cooking under the Poultry button. Turns out there was too much liquid. Changed to the Beans button and everything turned out fine. Well that’s odd. There’s no difference between poultry and beans as far as cooking. Both are high pressure- they just default to different cooking times. Did you fill it up past the “max” line, so that’s how you knew there was too much liquid? I’ve never heard of that happening before! I was continually getting the E6 error code for anything I didn’t have on a trivet. So, soup, chili, casseroles. I always followed each trouble shooting step listed here, but I ended up adding so much liquid, everything was thin and watered down. Live chat argued with me and said I must have the pressure gasket in backwards. I hadn’t removed it since I opened it, and besides, anything on the trivet or pot-in-pot worked. When I persisted and asked if there was a faulty series of pots, she said absolutely NOT. I did have the extended warranty, so if I pack it all up they’ll send a paid shipping label and said they’ll replace it, but clearly they aren’t happily doing so. Wow, that’s a shame! They must be getting a lot of calls lately or something, because others I know who have gotten replacements didn’t seem to have so much trouble. It’s odd that it works on a trivet but not within the pot itself. Something is definitely wonky there, no matter what they say. I’m glad they are going to replace it for you, though! Soups are one of the best things to make in the CPE!